Greece said the European Union was 'sleepwalking towards a cliff' by sticking to austerity rules that created huge inequalities among members, and it expected a debt relief deal for itself to be honored by end-2016 so that its economy could recover. Athens, facing a second bailout review entailing an unpopular loosening of labor laws in the autumn, is keen to show that painful tax rises and pension cuts as part of its 86-billion-euro bailout deal last year will bear fruit. 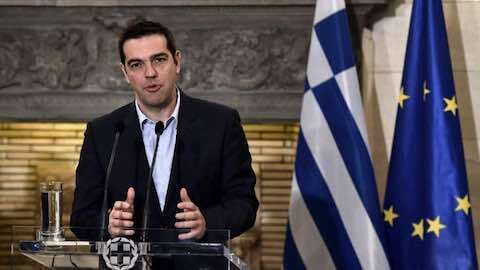 "Greece has kept its part of the agreement and expects the same from its partners. We are not simply seeking, we are demanding and expecting specific measures that will render debt sustainable as part of the deal we are implementing," Prime Minister Alexis Tsipras told the Sunday newspaper Realnews. "This (debt relief) will be followed by reduced (budget) surpluses after 2018, which will open the way for the economy's recovery," he said. Greece has committed to attaining a primary budget surplus - excluding debt servicing costs - of 3.5 percent of economic output by 2018 as part of its third bailout package since 2010. The IMF, which has yet to decide whether it will fund the third bailout, has said that surplus targets of 3.5 percent beyond 2018 are not realistic for Greece and has pushed for softer fiscal goals to take part in the financing. Greece's leftist-led government and the central bank also want lower primary surplus targets, arguing this will give Athens room to cut taxes and help the battered economy return to growth after a protracted recession. The economy has shrunk by a quarter in six years and the jobless rate is 23.5 percent. Tsipras also told Realnews that the European Union was "sleepwalking towards a cliff" as the Stability Pact's tough fiscal rules had engendered deep inequalities among member states. "Brexit will either awaken European leaderships or it will be the beginning of the end of the EU," he said, referring to Britain's June vote to leave the 28-nation bloc. He criticized Germany for acting as Europe's "savings bank" with excessive surpluses, frozen wages and low inflation, at a time when the EU's deficit-ridden southern members have broken all records for unemployment. "If (German Finance Minister Wolfgang) Schaueble's dogma for a multi-speed Europe and economic zones of low-cost labor is not abandoned, Europe will be brought to the brink of dissolution," Tsipras was quoted by Realnews as saying. Europe: "Greece: EU Sleepwalking Toward Cliff"